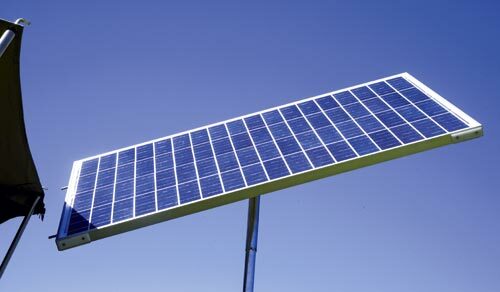 Solar power is energy that is converted from sunlight into electricity. Therefore solar power is a source of renewable and clean energy and is virtually free after setting up the solar power system. Like limited daily income, solar happiness requires, on average, more earned than spent, plus savings for periods of less income. Whilst seemingly obvious moneywise, many owners routinely running short of power add more battery capacity. That helps about as much as a second credit card: it increases overhead losses. Daily input is recorded in ‘Peak Sun Hours’ (PSH) — an industry concept similar to measuring daily rainfall. A Peak Sun Hour is a solar irradiation of 1000 watts/sqm over one hour. The solar equivalent of a rain gauge can be visualised as a ‘standard sized light bucket’. When ‘full’, that represents 1 PSH. The bucket may fill six or seven times daily during Hobart’s summer, but only once or so daily in winter. The daily maximum input in PSH, for any area, is available through the Bureau of Meteorology data but as camper trailers tend to be used almost anywhere, a simple and safe basis is to assume 2.5 PSH/day, south of a line from Geraldton-Townsville, during mid-winter and similarly 3.5-5.0 PSH/day during the rest of the year. Progressively north of that line assume about 5.0 PHS/day June to August, and 6.0-6.5 PSH the rest of the year. This includes some margin for typically overcast days. Instantaneous solar energy is expressed in watts. The amount drawn over time is expressed in watt hours (technically shown as Wh). A solar module that actually produces a steady 70 watts will, in one hour, produce 70 watt hours. Over three hours it produces 210 watt hours. Daily solar input is about 70 per cent of what it says on the packaging multiplied by daily PSH for wherever you are. A nominally 100 watt system thus produces about 70 watts x 5 PSH or so on sunny days in Brisbane: about 350 watt hours/day. The energy draw of electrical appliances works much the same way. A 5.0 watt LED light used for three hours draws 15 watt hours, a water pump that (typically) draws 60 watts and runs for half an hour a day draws 30 watt hours/day. Calculating solar input at 70 per cent of what it says on the packaging allows for the heat loss in the solar module (roughly five per cent for every increase of 10 C°) in temperate areas. Also allowed for is so-called ‘transfer loss’ due to the modules developing maximum power at a higher voltage than they can use. A further 15-20 per cent of that stored is lost via charging of the battery. Not good, but better than it might seem because solar input generated and used during sunny days is used directly by the load. Only that amount stored and then drawn is affected. 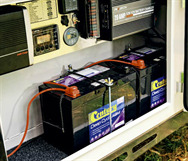 Deep cycle batteries (including sealed ones), but less so AGM batteries, suffer life-shortening damage unless they are fully charged every second day or so. Ironically, deep-cycle battery life span relates almost totally to depth of discharge. If discharged routinely by 10 per cent, they withstand that at least 3000 times, but if you do so by 90 per cent they may last a mere 100 times. A good compromise is 50 per cent discharge. In practice, most people have more battery capacity than they can realistically charge. Better by far to reduce battery capacity and maximise solar input. Doing that also ensures at least some solar input at almost all times. For reliable extended free camping that uses solar as the only source of power, battery capacity should not exceed that which can be fully charged (i.e. an overnight rested deep cycle battery voltage of plus 12.7 volts) by midday most days down south under average sun conditions and in typical usage. As solar capacity now costs only 25 per cent of what it did in 2010, the limit for camper trailers is now mainly that of space. Fortunately, efficiency (particularly of monochromatic modules) has increased: they now produce about 100 watts/sqm. A folding trailer-mounted rack can hold three nominally 130 watt modules, in reality about 275 watts, so 4 PSH results in a useful 1100 watt hours/day. During much of an Australian summer, it will be higher. By scaling system usage for minimum PSH, it will be close to weather-independent. An excellent approach is to have a second similar system in the tow vehicle using roof bar mounted solar modules. It is set up as a self-contained unit but with a provision to connect to the trailer if required. This precludes other roof rack usage, but the more one travels, the less one finds it is needed. As with portable solar modules, this often enables the trailer to be in the shade and the tow vehicle in the sun. Totally excluded is anything the main function of which is to heat: so leave the hair dryer at home. A minor exception is electric blankets used briefly. 12 volt versions draw 35-50 watts each. Microwave ovens are best omitted — or used only from a 230 volt mains supply. Usage is slashed by using a eutectic fridge in ‘pump down mode’. It is initially run at its coldest setting (empty or with deeply frozen water) for 10-12 hours. Thereafter it needs running an hour or two morning and night in temperate areas, or about twice that where it is very hot. The Australian-made 72 litre eutectic Oz-fridge chest unit draws about 400 watt hours/day. Indel (from Italy) has a door opening eutectic unit. Such fridges cost 10-20 per cent more than most, but that is more than offset by less solar and battery capacity required. Not practical for camper trailer solar is two fridges, unless one is in the tow vehicle and a smaller one in the trailer — each having its own solar array etc. Not remotely feasible is the ability to freeze and store (hoped for) catches of serious fishers. This is generator territory. Investing in a camping fridge? Check out our portable camping fridge guide. LED lighting is ideal for camper trailers. Two or three 5-7 watt LEDs provide ample light and draw only 45-60 watt hours if all are used for about three hours each night. Use warm white LEDs (2700-3000 K) for comfort, white light (5000 K) for reading etc. Laptops draw up to 50 watts so usage needs limiting, especially by teenagers. iPods and similar items draw far less, but need unplugging when charged, as some power is otherwise still drawn. 12 volt LED TVs draw less energy than LCD equivalents. Traditionally, small RVs had 36cm TVs, but 45cm units are more common now. Be ultra-wary of under $200 units, many made primarily for the Indian market, that draw 50-75 watts. Several (going for around $250), however, draw as little as 16 watts. By spending more on the TV you will end up way ahead by needing less solar and battery capacity.